Before 1880, the dispensing of medicines in New Zealand was largely unregulated. The Pharmacy Act 1880 set up a Board of Pharmacy and a registration system to protect the public from ‘amateurs and witchdoctors’. The terms ‘pharmaceutical chemist’ and ‘chemist and druggist’ could now only be used by a registered pharmacist. The first woman to register under the Act was Elizabeth Robinson of Christchurch, on 28 June 1881. Elizabeth had considerable experience as a pharmacist. 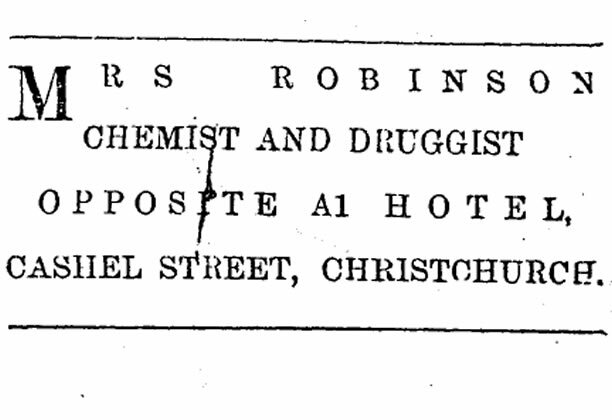 From 1863 to 1871 she had assisted her husband Richard in his Cashel St pharmacy. The Robinsons lived above the shop with their children, and Richard also offered dental services. After Richard’s death in 1871, Elizabeth ran the chemist business until 1886, when she sold it upon marrying a local hotelier. Before the First World War, women made up fewer than 5% of new pharmacist registrations. Within this small cohort, Elizabeth was fairly typical in that she had gained access to the industry via a male relative – but also unusual, as not many woman owned their own business for 15 years. In the twentieth century, it became less common for women to work in chemist stores; they were more likely to be employed in hospital dispensaries. The Pharmacy Act 1898 set up an apprenticeship system that created informal barriers to women entering the industry. The master chemist hired the apprentice, and there were concerns about young women working with older men in back rooms. Hospitals were a ‘safer’ environment for women to learn and practise the trade. Hospital dispensing was also seen as ‘women’s work’, as these tasks were undertaken by many nurses in the late 19th and early 20th centuries. We have 18 biographies, 5 articles, related to First registered female pharmacist.